RECENTLY, one of Nigeria most sought after duo of Mountain Black and Mad Melon, whom most Nigerians know as Danfo Drivers dropped another hit single .This has been making waves in the clubs, streets and events places. 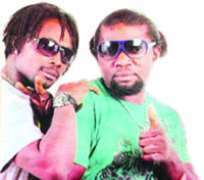 Danfo Drivers who had been out of the scene for a while are, however, out with a new single titled Meshango. According to them, they have just signed a recording deal with D&I Entertainment. The record company is saddled with the responsibility of releasing their forthcoming album. Apart from the single, the group's new video is also rocking the airwaves courtesy of David and Isaiah, the brain behind D&I Entertainment. You will recall that Polongo their major hit was an anthem three years ago. And the song was also used as sound track of a Hollywood flim, Phat Girlz. Since then the duo had gone under ground till now. D&I Entertainment is a relatively very young company in Nigeria. The company is based in Nigeria and Germany . But Danfo Drivers believe in their dream and also thank them for their encouragements and support they offer them. It is not easy to package artistes, so we must commend them and also our new management team, Events Aloud Entertainment.